Even though Jaden never got to breathe the air or smell the flowers, she has a beautiful story. A testimony to an almighty, loving God. I got up early Thursday morning to write some of it down. Jesus, You are enough for me. I trust You, Father God, and I trust that You have a perfect plan for my life. You know all things. Although this is the most difficult thing I have had to face in my life I know You are with me. As my mind would try to prepare for the labor and delivery of my stillborn child I could not help but to dread the event. How could I go through the process without the beautiful prize at the end? I have had no problem in the past with labor and delivery, no matter how long or painful, I was willing to do what ever it takes for those little babies to be as safe as possible. This time it would be so different, I was feeling upset that I had to go through it all and not have a beautiful baby to bring home when it was over. The thought of having her at the hospital repulses me, scares me, and makes me cry. How could this be happening. There where no signs, no warnings. This was the easiest pregnancy I’ve had. No morning sickness, no spotting. We found out that she did not have a heartbeat on Tuesday 12/02/08 with an ultrasound, another thing that I dreaded having. On Wednesday, I had a revelation. I knew in my heart that I needed to LOVINGLY birth this child as I had with all the others, no differently. I love this baby and because I love her I will give her the same beautiful, loving birth. I know her spirit is no longer in this body, but I will treat her birth the same as my others. I will lovingly birth her naturally and without drugs. I will choose to have a great attitude about being at the hospital and I will show my love the way I did to my other three children, during their births. Her life is just as important. Her spirit is just as alive. She just gets to see Jesus before we do. As soon as I chose to trust God, I had God’s perfect peace on my life. It covered my mind like a shield, a shield of faith. I am still just as sad but my emotions do not control me. I have resolve, I actually, in a confusing way (to my brain), look forward to the birth of this child. It suddenly comes to me, that this baby needs a name. It’s time to find a name for this little one. I get on the computer to start my search. Hadn’t thought much about names so far and we had no names for a girl picked out. I wanted to focus on the meaning of her name since we wouldn’t have to worry about how her first, middle, and last names sounded together or if it was a name that someone may tease her about. I wrote down about 25-30names, meaning things like “graciousness“, “tears of love“, and “ascended to heaven”, but I really didn’t love any of them. Thursday morning. Can’t sleep. I get up at 3:00am. I turned on the computer and came across a poem about stillborns and then goggled more of them. Needless to say, I had a good cry session and drenched a few paper towels with tears. 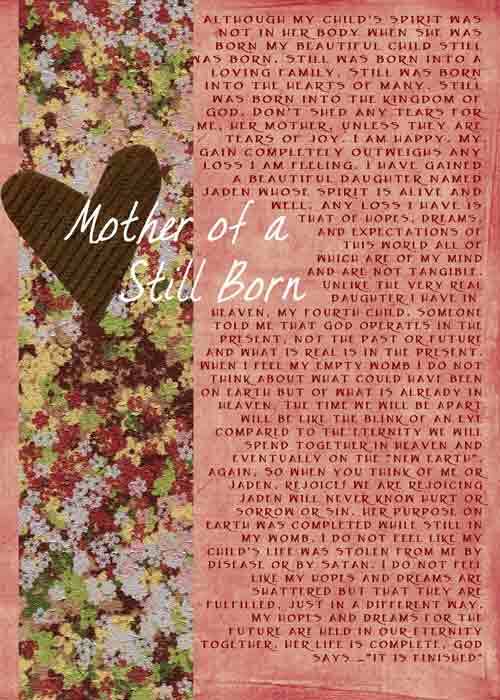 Something caught my attention, it was a poem called “Still Born”, not stillborn. I thought to myself, this baby could be still born, could still be born. My God is a God of miracles. I go find a Bible, I hadn’t opened one since before we found out about the baby. I had grabbed Elena’s Bible and opened it to a page that she had a sticky-note on. It was Hebrews 11. I started reading in the middle of the chapter about Abraham’s faith, Sarah’s faith, then about Noah’s faith, Enoch’s faith, then forward through the chapter. In verse 35 it says: Women received their dead raised to life again! God what are you trying to tell me? Do you want me in faith for this baby to have life? I know You are able. Yesterday, I was resolved. I was OK with losing this child and lovingly birthing it. This was not in my thoughts to believe for life. They say it has been at least 2 weeks. What are You doing, God? I can and am willing to stretch my faith toward this, if this is what You are saying. I understand that without faith it is impossible to please You, God. And I also understand that some people die in faith and that just because you require it does not mean that I will see the thing come to pass. But because You have put this thing on my heart when I was not asking, I will now dare to believe and I will ask You for it. You are a God who wills to bring the dead back to life spiritually and physically. Your Word says so. I went back to the computer and my list of names to look for one for this baby. This time was different though, like when my heart changed about the birth, now my heart had changed about the meaning of this child’s name. I found the perfect name for you, precious baby of mine. Welcome, Jaden Eliana! Your name means, God has heard and My God has answered me!! What a perfect name for a perfect baby girl. Your middle name is also Elena and Ariana put together. God is good. Glory to God. If anyone were to ask me if could survive having to give birth to a stillborn baby , my first reaction would have been …absolutely not. It is only by God’s strength and His love that we can walk out the really hard things we have to face. Jaden has a story even though she never lived on this earth. I can’t tell you how many lives have been touched by her. Lane and I have watched God orchestrate a beautiful thing around her birth. We know that many people have been praying for us during the last 9 days including many who have never even met us but know a friend or family member of ours. I could feel the peace that came from those prayers, the peace that passes understanding. I experienced first hand the power of intercessory prayer. This week I had one lady tell me that while she was praying for me she had intense anger. I told her, “thank you, you took my anger so I wouldn’t have to”. Another one of my friends in North Carolina had an unexplainable fear of hospitals and what could happen to us there. I said, “thank you , I didn’t have any fear at all. My friend’s husband (they live in Arizona) called me on Friday night before the birth. It was hard for him to speak because he had so much sorrow. He left me a message and I know that he was carrying the sorrow for me. God prepared me for what I thought would be a horrible thing and He made it into a beautiful, glorious thing. I guess that’s what He does. Saturday morning, at home, I felt His presence, I knew He was there in the room with me as He comforted me. I knew I had the peace and the strength , from God, to give this daughter of ours the special birth that I, as her mom, wanted her to have. On Saturday morning we went to the hospital, the Doctor and all the staff showed Lane and I nothing but love, and respect. They comforted us and made us feel safe. They catered to every wish we had for this day. Our first nurse shared with us that God woke her up in the middle of the night to pray for us, she didn’t even know our names yet. She prayed that she could be our nurse but her heart was that we would get whichever nurse would meet our need the best. When she got to work, she was not assigned to us. She told God …That’s OK. But before we even got to the hospital the nurse assigned to us told Nancy that her kids had her up at night and she didn’t know if she had much to give so Nancy got to take her place. Nancy shared, with us, stories of how God worked in her life this summer, things I needed to apply to my own life to get through this birth. While in the hospital waiting for my contractions to start, I was flipping through the TV channels and I heard a Pastor talking about Rachel. The Bible says in Jer. 31:15..‘This is what the LORD says: "A voice is heard in Ramah, mourning and great weeping, Rachel weeping for her children and refusing to be comforted, because her children are no more." I made a choice to be comforted and to trust God and He did the rest. This labor was more intense than my labor with Ariana and I am glad because this was my way that I could show Jaden, by an act of love, how much I do love her. Jaden’s little body was so beautiful. She looks like her sisters and her brother. You could see that on the outside not a single thing was wrong with her. And I suspect that they will not find a single thing wrong with her on the inside either. We all have a purpose to fulfill on the earth and she was able to fulfill hers from my womb. I miss her precious little spirit even though I have not yet met her. Parents have an amazing connection to their children’s spirits, just like God has a connection to our spirits. I am honored and privileged to have carried her spirit with me for almost 8 months. The world does not place value on an unborn child but little Jaden is an example to us the incredible depth of her value to God. And the incredible value He places on each one of us. God values each one of us enough to watch while His ONLY child suffered pain and death so that we could all be together with Him and the ones we love some day. We look forward to the day that we meet you sweet Jaden, your family loves you very much. If you would like to contribute a stillbirth or miscarriage story, please contact us and we'll add it to the site. Thanks.